British Organ Blowing was founded in 1932 by Mr Arthur Fryer to produce a range of quiet running blowers for use in church organs. With the help of Harold Tomlinson as factory manager the business flourished over the years and began to produce cast aluminium fans and blowers for industrial use. 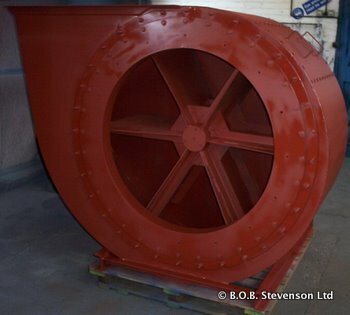 Upon his retirement in 1976 Mr Fryer sold the business to Graham Perrott who invested in the company’s infrastructure and acquired the Gordon Stevenson Fan Company and the William Alldays Alcosa range of RB & BI centrifugal fans. With Alex Stanley as Sales Director and Ivan Terry as Managing Director the company began to build up a portfolio of satisfied OEM customers and reached a peak of around 30 people on the shop floor. When Alex & Ivan retired in the late 1990’s Dr.Manning was brought in as Managing Director and Mr.Perrott again invested in the future of the company through the acquisition of Flamgard Fans and a move to larger more modern premises as well as signing a manufacturing and sales agreement with Piller, GmbH of Germany to provide their high pressure high efficiency centrifugal fans for process applications within the U.K. market. In 2001 Leonard Perrott, Graham’s son, became Managing Director and set about restructuring the business around core products and customers, relocating the business back to the original Coleman Street factory. 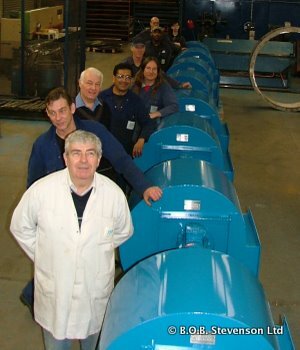 In 2001 we also began to manufacture the Turngrove range of axial & bifurcated fans. Currently the company has 15 employees most with over 20 years loyal service to this family run engineering business.